Brigadier Messenger joined the Royal Marines in 1983. After a range of junior officer appointments, predominantly in regimental service and including a 1 year Mountain Leader course, he attended Canadian Staff College in 1994. Two staff jobs followed, in MOD (SO2) and HQRM (SO1) before he was appointed as Chief of Staff to 3 Cdo Bde RM in 1999, a tour that included an operational deployment to Kosovo as COS MNB(C). He commanded 40 Commando RM from Dec 2001 to Aug 2003, which included operational tours to Afghanistan and Op TELIC 1. After a sabbatical in Geneva, he joined JFHQ as COS in Jul 2004, a job that saw him on various operations worldwide, including Op GARRON, the tsunami relief effort, Op HIGHBROW, the Lebanon evacuation operation and a six month tour in command of the Op HERRICK Prelim Ops deployment. After attending HCSC, he briefly acted as Director Force Development before being appointed to the position of Director Joint Commitments (Military) in MOD in Sep 2007. 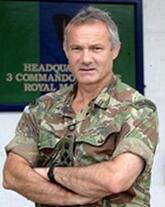 Brigadier Messenger assumed command of 3 Commando Brigade RM for their upcoming deployment to Afghanistan in Sep 2008. Married to Sarah with three teenage children, he enjoys running, rugby, rock climbing and real ale.